If you want to cook Cajun food properly, it is essential to understand the ingredients and terminology. Cajun food is very place specific, and is hotly contested even among locals in terms of ingredients, techniques and recipes. Family recipes are passed down for generations, and the combinations of ingredients, spices, and terroir makes the food what it is. Every family has a jambalaya recipe and the best way to make the roux for a gumbo. Many still smoke their own meats and make their own sausages, and in the summer months harvest their own ingredients from their gardens. There is a certain integrity to Cajun food that is true of all great cuisines. It is by and large simple food with deep, complex flavors. It is rarely what people think, especially not blackened or overly spiced. I have spent a great deal of time researching, recipe testing, cooking, and most importantly eating this stuff. I love it and I want to share it to the best of my ability. As a French trained cook with a feel for spice, Cajun cooking was a natural fit for me. It has the richness and ingredient driven qualities of the best French food, while providing the spice associated with Latin or Asian food. In short, it is divine. Since I am going to be sharing recipes on this site along with anecdotes and football musings, I thought it would be helpful to start with a glossary of essential terms in Cajun cooking. To all my Louisiana friends, please bear with me and feel free to correct me when I stray. Abita (pronounced Ah-bee-ta): One of any number of beers brewed by the Abita Brewing Company in Abita Springs Louisiana. The most common variety is the Amber, followed by the Turbo Dog and Purple Haze. Abita also makes a variety of seasonal beers including a Strawberry and a Pecan. Abita is often the start to a great day of cajun cooking, be it crawfish boils or tailgates. It is also an excellent medium with which to cook, if you can avoid drinking it before hand. Andouille (pronounced Ahn-doo-eee): Andouille is a pork sausage that is heavily spiced and smoked. Unlike the French andouille which is made of tripe, cajun andouille is made of pork shoulder that is diced and mixed with fat, and seasoned with garlic, salt, pepper, and cayenne. It is then stuffed into casings and smoked for several hours, and then dry-cured. Andouille is one of the critical flavoring ingredients in Cajun cuisine, and it’s great in greens, and essential in jambalayas and most gumbos (although I don’t use it in my seafood gumbo). Bacon: The salt cured and smoked belly of a pig, which comes in either slab or sliced form… otherwise known as the most delicious thing EVER. Bacon is usually cured with salt, sugar or maple syrup, pink salt, and smoked over hickory or applewood. It is an essential flavoring agent in a variety of Cajun dishes, but especially any kind of bean dish or any dark leafy greens, especially collards. The rendered fat of bacon is an extremely versatile and flavorful cooking medium, and can be used for anything from cooking cornbread to frying chicken. The importance of bacon cannot be overstated. Beignets (pronounced Ben yae): A fried dough that is usually served as a dessert and topped with confectioners sugar, but is sometimes used in savory applications. Best eaten hot and served with chicory coffee. Blackened: You burned it. Throw it out and start again. Also refers to the technique perfected by Chef Paul Prudhomme and pretty much ruined by all others. Black-Eyed Peas: These have nothing to do with Will-I-Am or the Dutchess. Black-eyed peas are simply delicious. They are most often cooked along with ham-hocks, slab bacon, or some other type of pork, as well as with onions and garlic. Cooked until tender and slightly creamy, black-eyed peas are good luck when eaten to celebrate the New Year. Boil: This most often refers to crawfish, but could also refer to shrimp or crab that are typically cooked in a large pot over an open fire, almost always at a social gathering. The boil is usually heavily spiced with Zatarain’s or a home blend of spices, and typically includes red potatoes, sausage and corn, along with the seafood. A boil is the highlight of ANY event that it graces. Boudin (pronounced boo dahn): a sausage consisting of pork, liver, rice and spices that is first cooked and then stuffed into casings. It is, along with Andouille one of the quintessential sausages in Cajunland. If removed from it’s casing, rolled into balls, coated with breadcrumbs, and fried it, becomes the delicious snack known as Boudin Balls. 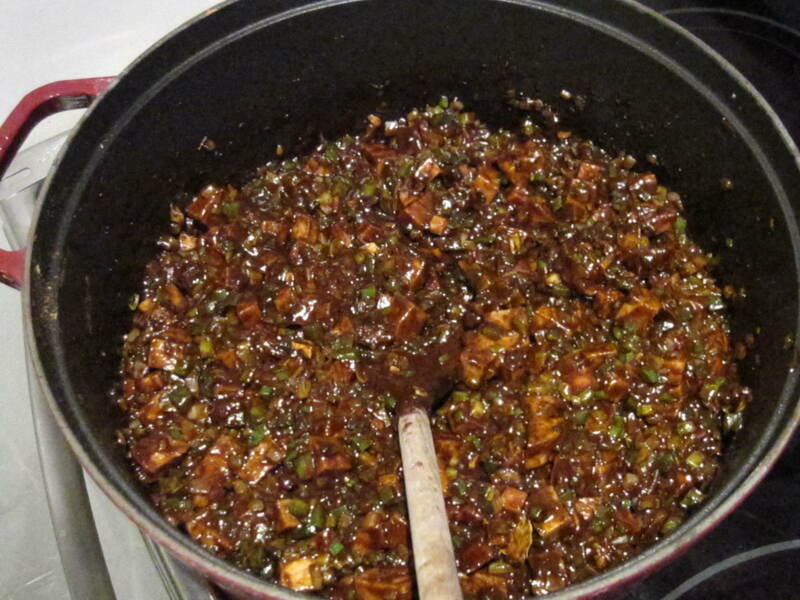 It is also an excellent stuffing for chicken and pork. It goes without saying that it is delightful on it’s own. As with many foods, it is best enjoyed with an Abita. Brisket: A cut of meat from the breast of a cow, this is a BBQ staple, and most strongly identified with Texas. It is popular throughout the south, however, and has a rich flavor as it is a strongly worked muscle. Best seasoned simply and smoked slowly for hours, or conversely, braised. A combination of the two techniques also yields good results. When sliced thinly against the grain, it is a delicious treat that makes a great sandwich. Cajun (pronounced Cay-jun): The descendants of the French exiles from Canada who settled the land which is now Acadia Parish in Louisiana. Cajun and Creole are not interchangeable, and if you think they are you are looking for a fight. Cajun Microwave: A box into which a whole pig is placed and cooked. The pig is put in the box, and then the top is placed on. The top contains a tray into which hot coals are placed, radiating the heat from above like a broiler. The result is a crispy and succulent swine. Cast Iron: The essential cooking material in all rustic cooking. Also, how tough the people of Cajunland are. Celery: One of the vegetables which makes up the holy trinity or trinity. Chicken: used in gumbos and jambalayas or simply roasted, an important flavoring ingredient in cajun food. Buy chickens whole and save the bones for stock. Cochon de Lait (pronounced koe-shon-deh-lay): A pig roast. Sometimes cooked over an open spit, sometimes in a Cajun microwave. Cornbread: A lightly leavened bread consisting of cornmeal and flour, milk, eggs, and optionally sugar. Baking soda is leavening means. Cornbread is best cooked in a cast iron skillet coated with bacon fat in at least a 400 degree oven. It is a perfect side to almost anything. Crabs: One of the great ingredients in Louisiana. Blue Crabs have two distinct seasons, hard shell and soft shell. Hard shell blue crabs are delectable in boils, but it is a good deal of work to tease all the meat out of them. That is why it is a social occasion where you stand around and drink lots of beer while you do it. Picked crab meat is also a popular topping for fish, as well as being an excellent stuffing, and of course standing alone as a crab cake. To me, blue crabs are best when in their molting season and known as soft shell crabs. Soft shell crabs can be eaten whole, and can be grilled, sautéed, or deep fried. They are buttery and rich. Cracklins: Otherwise know as crack. These addictive morsels are made from either pork belly or back fat that is fried until crispy and golden brown on the outside and tender inside, like a pork french fry. They can be found throughout Cajunland, and the Mrs. says she gets the best kind at a local gas station. Crawfish: A freshwater cousin of the lobster, also known as the mudbug for their penchant for burrowing into the muddy swamps. These delectable creatures are served many ways, but the two most popular are crawfish étouffée (see below) and in a crawfish boil (see above). Crawfish season typically runs from March to June. Crawfish Étouffée: A classic dish, akin to a crawfish stew. The basis of the dish is a roux (see below) that is cooked until the red stage, to which the trinity (see below) is added, and then a crawfish tails and stock. It is slightly spicy and always served over long grain white rice. Creole (pronounced kree-ole): Creole is the word usually used to describe the city cooking of New Orleans, as well as people of mixed African and European descent. It was first applied to white people of French/Spanish descent who were born in the colonies, but now is more likely to be applied as previously mentioned. Creole cooking is considered more complex in influences than Cajun, encompassing Spanish, French, African, and Italian. For practical consideration, the use of tomatoes (and okra) is what often separates Creole from Cajun, especially in shared dishes like jambalaya and gumbo, as creole often contains both and cajun does not. Deer: An important game meat in cajun cuisine. Used for sausage, and for any cut you would use lamb in. Gamey and delicious. See venison. Duck: A prized game animal that is now available in most good markets. Roasted whole or used in gumbo, or made into confit, duck is a classic ingredient in both haute and rustic cooking. Also, the rendered duck fat is one of the most flavorful cooking mediums imaginable. Great for sautéed potatoes or as the fat in the roux of a duck and andouille gumbo. Étouffée (pronounced eh-too fey): Meaning smothered in French, this typically denotes a dish that is cooked in or topped with a roux thickened stock or sauce. Crawfish Étouffée is a classic example of this. Figs: A tree fruit that is popular in Louisiana. Great for snacks, deserts, salads, and pretty much anything else of which you can think. Filé (pronounced feel-eh): A powder made from sassafras leaves used to thicken gumbo in Cajun cookery. Fish: A staple of the coastal and inland cooking of the cajuns. Redfish, Catfish, Trout, Drum, Bass, etc. are all caught fresh in the waters of Louisiana. They are cooked in every way imaginable. Garlic: Essential flavoring ingredient, when added to the trinity it becomes the four seasons. Greens: Usually refers to collards (although kale is an excellent substitute), and can be stewed with slab bacon or ham hocks, or sautéed with garlic and butter. One of my favorite sides. Gumbo: This is the mother of all Louisiana dishes. Gumbo is a cross-between a soup and a stew. It is always started with a roux, a combination of fat and flour, that is stirred together over heat until it achieves a rich brown color. How dark the roux is allowed to get depends on the dish and the cook. After the proper roux color is achieved, the vegetables, known as the Trinity (see below), are added, and then the remaining ingredients. The two main types of gumbo are chicken and andouille and seafood. Cajun differs from Creole in the absence of tomatoes, and the use of filé as the thickener. Creole contains tomatoes, and okra is used as the thickener. Sometimes filé and okra are used, although many discourage this practice as they say it makes the gumbo “ropey.” Gumbo is usually served over white, long grain rice, although some like to serve it with potato salad. Ham Hocks: The lower leg of the pig, typically cured and smoked. A delicious flavoring ingredient for soups, stews and greens. Hush Puppies: A cornmeal dumpling that is fried. It’s name derives apocryphally from the fried dough balls used to quiet the dogs during the Civil War. A seriously delicious side dish. Jambalaya (pronounced jum-bah-liah-a): A signature Louisiana dish that in it’s most basic form contains rice, andouille sausage, and chicken, along with the trinity. Jambalaya is a quintessential one pot dish, like the Spanish Arroz con Pollo, but spicier and with a deep, rich color obtained through layers of carmelized meat and vegetables. Jambalaya is peasant food elevated to it’s logical conclusion. It is perfect in and of itself, yet is also adept accompanying other dishes. It is one of my favorite things to cook and eat. Maque choux (pronounced Mahk-shoe): A sauté of corn, peppers and tomatoes that is a flavorful side dish. It is excellent with both meat and seafood, and is particularly good with soft shell crabs when in season. Mustard, Creole: A grainy mustard with horseradish mixed in for an extra kick. My favorite mustard. Natchitoches Meat Pie (pronounced Nack-it-ish): An empanada-like snack. A savory pie dough is cut into rounds and topped with a spicy meat filling (usually beef, but could be anything); the round is then folded over on itself to make a half-moon, and the edges are crimped with a fork. The pies are then fried to a crispy golden brown. These things are absolutely addictive, and are perfect for Super Bowl parties. Nuts: Pecans and almonds are the most popular nuts to cook with in Louisiana. Okra: A podlike vegetable brought to the United States by African slaves. Some don’t like it because of a perceived slimy consistency, but if cooked properly, this doesn’t occur. Okra pairs naturally with tomatoes, is unbelievably good fried, and adds thickness and depth of flavor to gumbos. If you think you don’t like okra, give it a second look, because it really is good. Onions: Another vegetable in the trinity. Oysters (pronounced Er-sters): This bivalve, local to the coastal waters of Louisiana, is used in countless dishes. Whether served simply on the half-shell, fried, bbq’d, pan roasted, or added to cornbread dressing, oysters are delicious and versatile. Unfortunately, oysters were hard hit by the recent oil spill, so care should be taken with their consumption. While I would like to believe the reports about the health of the seafood, I am still not sure. That being said, I also think it is crucial to the survival of the locals to consume local products. Maybe split the difference and buy local but just limit consumption. Gotta die of something sometimes anyways. Paprika: A spice common is cajun cooking. Adds depth and a slight hint of spice. Pecans: A nut native to Louisiana that is a staple in pies, and in savory dishes as well. Pecans have a natural sweetness and buttery texture. Peppers, Bell et al: The third ingredient in the trinity. Bell peppers add the fresh green flavor and the hint of spice. Green bells are traditional, but I find red bells work well in conjunction in certain dishes like jambalaya. Chile peppers are also useful in cajun cooking, as mild and semi-hot peppers like poblanos and jalapeños can add a nice depth of flavor along with the dried spices like cayenne and chili powder. Piquant, sauce (pronounced pee-khant): A spicy tomato based sauce that pairs well with chicken or shrimp. Po’ Boy: The state sandwich of Louisiana. Although developed in New Orleans, they are eaten everywhere. Shrimp, oyster, and roast beef are the prevalent varieties. Pork: The most versatile meat ever. Whether it be a smothered roast, smoked ham hocks, or ground into sausage, pork adds flavor and unctuousness to everything. Cajun cooking relies heavily on pork. Rabbit: Almost as popular as chicken in the south. If you can watch or read Watership Down, you can eat a rabbit. Chef Donald Link makes a great Rabbit and Dumplings at his New Orleans restaurant Cochon. Redfish: A white meat fish similar to bass. Paul Prudhomme became famous for blackening this fish, but I prefer it simply seasoned and grilled, pan roasted, or broiled. Butter and lemon always go nice as well. Rice: One of the staple crops of Louisiana and served much the same way we serve potatoes up north: with everything. Long grain white rice is the standard, although some prefer converted because the grains stay more individual. If you want to cook Louisiana food properly, the one thing you better get good at is cooking rice. It can make or break a dish. Roux (pronounced Roo): The combination of equal parts flour and fat that is cooked over heat until combined. Used as a thickening agent. The classic French roux is equal parts butter and flour that is cooked usually only to the light blonde stage. Cajun roux is typically made from equal parts oil and flour and is often cooked to a much darker color. In the case of a gumbo, the roux is cooked until at least a mahogany color, and by some until it is almost black. Roux is a critical flavoring ingredient that must be done correctly, otherwise the whole dish is ruined. See blackened. If you have a short attention span and can’t stir or control the heat, roux can be baked in the oven passably. Never make roux in a microwave though… I don’t care what John Folse says. Sausage: The two major ones are Andouille and Boudin, but deer and simple pork are prevalent as well. As cajun cooks have a strong butchering and charcuterie element in their culture, sausage making is still a thriving art. Shrimp: Harvested in the coastal waters, shrimp are along with crabs, crawfish and oysters the most important of the shellfish served in Louisiana. There are countless shrimp dishes, from the boil to the bbq’d. They are great on a Po’ Boy, and sublime in a piquant sauce or an étouffée. Shrimp require careful cooking so they don’t get rubbery. Always buy head and shell on, and if you are peeling, save those heads and shells for stock. Stock: If you only get good at two things in cooking make one of them stock (and the other is cooking rice). A good stock is the basis of countless dishes. The most versatile is chicken. Good seafood stock is also useful to have on hand. Tasso (pronounced Tah-so): Made from the pork shoulder, cured in a salt box, heavily spiced, and then smoked, tasso is a cajun ham that is a superb flavoring ingredient. It adds smoke and spice to gumbo and greens, and texture and flavor to jambalayas and beans. Tasso is like ham on steroids. It packs that much of a punch. It is one of my favorite flavoring tools. Trinity, or Holy Trinity: The mixture or diced celery, bell peppers, and onions that forms the flavor base for so many cajun dishes. Similar to the Spanish soffrito, when garlic is brought to the party it is known as the “four seasons.” It is typically sautéed first, and then other ingredients are added in. Venison: Deer meat. A staple. Get over it, Bambi is delicious. Zink: Where you wash your ersters at… in the zink. What a cool post. As someone from the midwest (iowa,) it was really interesting to see all these defined! The “Maque choux” and “Natchitoches Meat Pie” sound awesome! Can you buy duck fat? Never thought to use it until I saw Potatoes fried with it on the Food Channel. Yes, you can buy duck fat. D’Artagnan sells it, and you can probably get it at most specialty meat markets. You can also render it yourself, if you have access to duck skin with the fat on it.